Albert Robida (1848-1926), illustrator, caricaturist and novelist, particularly well known for his science fiction works, was throughout his life a indefatigable traveller, armed with notebook, eraser and pencil. He visited Italy, Switzerland, Spain, Normandy, Brittany, Touraine, Provence and Flanders, and travelled up the Rhine, always motivated from a historical and archaeological standpoint, keen on the conservation of artistic treasures of the past. His journeys leads to travel writing that was particularly rich, both from the point of view of the quality of the text and the care devoted to the lithographs accompanying it. His work on Brittany, published in 1891, provides an occasion to paint a picturesque, but sufficiently precise, portrait of Morlaix, a town mutilated by the urbanisation work under way. “One of the most complete examples of these beautiful ornate façades can be found in the Rue des Nobles, above the marketplace. It is the house known as ‘Queen Anne’s house’. There are two floors and a gable on a ground floor made of elegantly moulded stones like all of the old houses in Morlaix; on the upper levels, long lines of windows are set close together as opposed to dispersed, separated by small columns; that is, a continuous fenestration, opening outwards, with statuettes under the huge beams. The former town house then belongs to Henri de Lestang du Rusquec, who bought it in 1882. This acquisition was prior to its listing (on 28 May 1883) as a historical monument, which thus spared it from the planned demolition. However, it was not until 1890-1891 that it could be restored, in particular thanks to a subsidy granted by the Ministry of Public Education and Fine Arts. The municipality had previously said that it would contribute to the costs of restoration as long as either the façade of the building on the road was moved back to bring it in line with those of its new neighbours, or the house was simply taken apart in order to build it again in another place. Faced with hostile reactions, particularly those of the ministry, it decided to not to intervene. 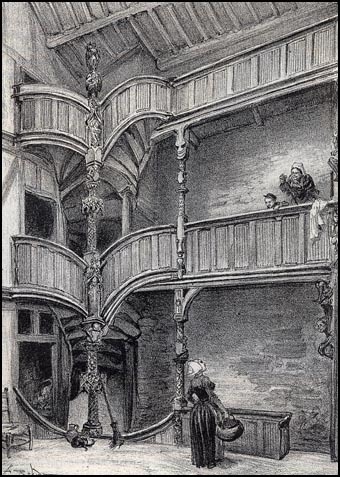 A. ROBIDA, La vieille France – Bretagne (Old France - Brittany), Paris, La Librairie illustrée, 1891, cf. p. 158-159. Entire chapter by Albert Robida (in French).